(CNS): The battle against the importation of illegal goods and duty dodgers is about to get a whole lot easier for local customs officials. With the arrival in Cayman of the Heimann Cargo Vision Mobile (HCVM) x-ray inspection system every single container imported into and exported from the islands will be inspected. The non -intrusive scanner is only days away from becoming fully operational paving the way for a new freight security initiative that customs will introduce this month as part of routine import and export procedures, Customs authorities said. Collector of Customs, Carlon Powery said he was delighted that the department would be able to meet a long standing goal. Smiths Detection won the bid to supply the government with the non-intrusive inspection system (NIIS) and the HCVM system is currently being tested here in Cayman following tests in the factory in Europe. Four more conventional x-ray inspection systems will also be arriving shortly, officials revealed, which will be installed at the Airport Post Office, the customs courier service facility, the airport transit warehouse and inside the inland depot warehouse. With a new container traffic flow design as well as the new scanning procedures at the Cargo Distribution Centre, officials expect that traders will continue to receive cleared goods in a timely manner. The project coordinator Jeff Jackson said the system will be a boon to end-users, the majority of which are law-abiding customers. 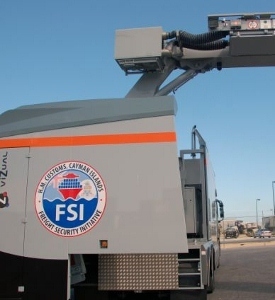 But the scanner will enhance customs’ border control capabilities and guard against terrorism without disrupting traffic flow, Jackson added, as the system can also detect the presence of radioactive materials inside containers or vehicles. Training is now underway for end users including truckers and local traders to sensitise them about radiation and associated risks as well as to address any concerns about the system which Jackson said is used extensively worldwide. Customs personnel are also being trained in the operations and maintenance of the systems. The computer controlled, remotely-driven mobile HCVM scanner emits radiation less than the quantity a patient gets at a dentist’s office, explained Peter Southwood, head of the installation team. A tightly controlled beam rapidly and fully scans all the contents of the inspected item, such as containers which will remain on the truck transporting them, he said. A high concrete block wall built to border one side of the scanning bay at the CDC merely provides additional protection, as a precaution, for persons behind the wall when the system is in use. With a stationary truck and mobile scanner, the trucker will be out of his vehicle when the scan is underway, getting back on only after the scan is complete, the expert added. Since we are now moving to the year 2012, can we please also get a more automated duty payment service at the customs office at the airport? I don't get why in this day and age those people taking the duty payment still have to use a caluclator to determine the duty payment and fill in paper work by hand and have then two copies which need to be filed etc? Use computers use, store the data online! This is a great start. When customs officers are trained to use the new equipment please also set out again the consequences if they are caught abusing or not properly operating the equipment or not following proper reporting procedure. Then for once make sure you follow through and charge customs officers who have been caught doing (or not doing) things they should have been doing! I have no problem with this new "approach"to checking our arriving and depearting containers BUT I still think that a proper visual inspection before or after should still be done manually.Just a hopefully helpful suggestion. scanning won't stop the drugs or anything else someone depserately wants sent out or brought into Cayman!!. Need honesty to do this kind of job & customs here has lost a lot of faith with us all for their inability to be efficient, courteous, polite & offer good customer service. At least Immigration is 100% better than it was 10 years ago they seem to have applied their customer service skills! At least you get a good morning instead of a grunt or nothing at all. Looks really good to our visitors!!!!! 1. Get the Customs Officers some boots and plastic overalls (have you ever seen them get their uniforms dirty or break a sweat after going thorough the cargo hold of a boat? ), equip them with shovels and order them to thoroughly dig through the ice and bait boxes on every boat that brings in the snappers from Honduras. You might need to have a senior officer nearby to witness the process to make sure it gets done right. Also we know that organised crime is not averse to providing financial incentives to turning a blind eye, so it is critical that there is a very random process to assigning the officers; each day is a new day and the neither boat operators nor the customs officers should know who has been chosen to inspect a vessel until moments before the check begins. There should be terrible penalties for officers found guilty of corruption. The second proposal is this: Get the customs officers to thoroughly check all containerized and uncontainerized material that is leaving for Jamaica and Honduras. Exporters should provide (receipts) proof of ownership of everything leaving. Serial numbers should be recorded. Most importantly it is time for the customs officers to liaise with the RCIPS to determine if there are any boat engines, bicycles etc. or other items on these boats that match a data base of stolen property. Check the items and run the serial numbers and or descriptions through a database. Catch some people, start seizing boats, prosecute someone, make them sweat everytime your inspection team shows up. The current process is broken, there are insufficient checks and it is time for the Collector of Customs and Chief of Police to put their collective heads to together and find a much more rigorous process for inspecting certain exports. It is too lax, it is too easy to get stolen stuff off the Island. While the majority of the exports are probably legitimate, you see them packing these boats at the port, or stuffing a container just past the security entrance of the port warehouse centre and it is quite clear that there is insufficient scrutiny going on, it is very possible stolen goods are being moved out in an organised way. Right now the criminals don't fear the authorities enough and it is possible that Customs may not be adapting quick enough to keep up. Think about that and change it up. Work with the RCIPS and start trying a couple of unpredictable and unexpected moves on the exporters and you would be suprised what might show up. Once again a couple million dollars has been spent from the public purse to sound like "All is well & the problem will be fixed". Its just not that simple. From recent reports of custom officer being under investigation & the firing of some a scanner is not going to give us a 100% protection. They have a small scanner at the airport that cost the public purse, it never gets used. It was their new toy in the beginning and now it just sits there I'm assuming the same will happen to this large piece of equipment. This department needs an overhaul straight from the top. Please stop giving us lip service & have your 100 plus employees get off their A** & do the job for which they are paid. Protect our Boarders, exercise ethical conduct and improve customer service for just a start. POSITIVE!! Why is it that regardless of what is written on this site none of you can say something POSITIVE? You moan and groan about everything and when any suggestion or solution is put forward you moan and groan about it. Should everyone just sit back and have you all put your solution forward instead?? Solution 101, MOAN & GROAN!! There you go, that always fixes everything. Youmoaned & groaned about Customs not doing enough about controlling contraband through our Port. They responded by implementing a State of the Art solution that is used in some of the highest and most sophesticated Ports in the world. Instead of saying, hey guys thanks for hearing us and doing something about the issue. What do you do? YouMOAN & GROAN! I have never seen anything positive come out of negative negative in my life, but then again perhaps since this is "your solution" to everything I could be wrong and you all could demonstrate this? Cudos to the Customs department on this giant step forward! Thanks for getting and implementing a piece of equipment that probably many other less fortunate and in very much need of countries would love to have. Keep up the fight! Good to know they are scanning containers going out too. Thats where the booty from all the robberies is going. Outta here on containers. Last time i check lead was the only thing that can fully protect humans from x-rays not concrete. Got to get all these construction tools, windows and doors, Tv and internets, that I have ilegally in my possession on that container boat before that piece of equipment is in operation. Got to tell mi friend not to use the magnet block to strap the herb and the guns at the bottom of the container. Now ah wonda if mi inside man goin read dis machine. Laud ah caan aford pay anymore money, cause mi jus pay 400 dollar fe me driving licence, and 400 hundred dollar fe mi baby mudda visa an driving licnece. Stress goin kill mi when this scammer come. Sadly, there's a difference between scanning things and actually finding contraband. In fact abuse of this equipment can actually make it easier for things to be slipped through. I hope I'm proved wrong but it seems that it might take more than expensive hardware to deal with the problems in Customs. Of course it is all dependant on the honesty of the operators! Are they going to scan the custom officers too???? Exposure to high levels of radiation can cause cancer. I hope the government has safegaurds in place to protect it's workers that will be operating this equiptment.